The villains are running amok in the Magic Kingdom and the original park of Walt Disney World has been recruiting sorcerers to help save the kingdom. Putting guests in the middle of their own adventure has always been a key component of the park-going experience, which has been kicked up a notch with the introduction of Sorcerers of the Magic Kingdom. Roundtable Topic: What are your thoughts about the Sorcerers of the Magic Kingdom game debuting this month at the Magic Kingdom? Roundtable Contributors: Chris Fore (Adventure Veranda), Andy Jackson (Eating (and Drinking) around the World), and yours truly. Chris – I'm cautiously optimistic. For me, this is going to come down to the execution. What will the impact be on the cosy confines of the Magic Kingdom? Will the attraction draw guests further into the environment, or take them out of it? How will the guests who *aren't* participating be affected? The only similar experience I've done myself is Kim Possible's World Showcase Adventure (which I really like). What I like about the KP Adventure is that it encourages guests to step off the promenade and explore the wonderful details of World Showcase. I also appreciate that the various KP "installations" blend in and basically work as details even if you aren't playing the game. But for all that, even I can find the Kimmunicator "ring tone" distracting after a while, and there have been times when I felt like I could see a literal queue of guests following the trail and waiting their turn for each station. I wonder if the experience would be better suited for an environment like a resort (or Downtown Disney, for example)? Having said all that, my curiosity is piqued. I'm a techie, and what I've seen so far looks very cool. I'm also intrigued about the "trading-card" aspect of the game, as a social component could be very interesting indeed. Now that I've babbled on let's get down to it... I think this is going to be great! 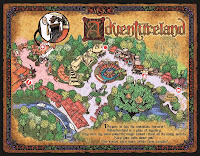 I've been a big fan of Kim Possible (of course you can play that with cocktails in hand...), and enjoyed being able to test the possible Wilderness Explorer game in Animal Kingdom, and the Sorcerers game has the potential to be huge. 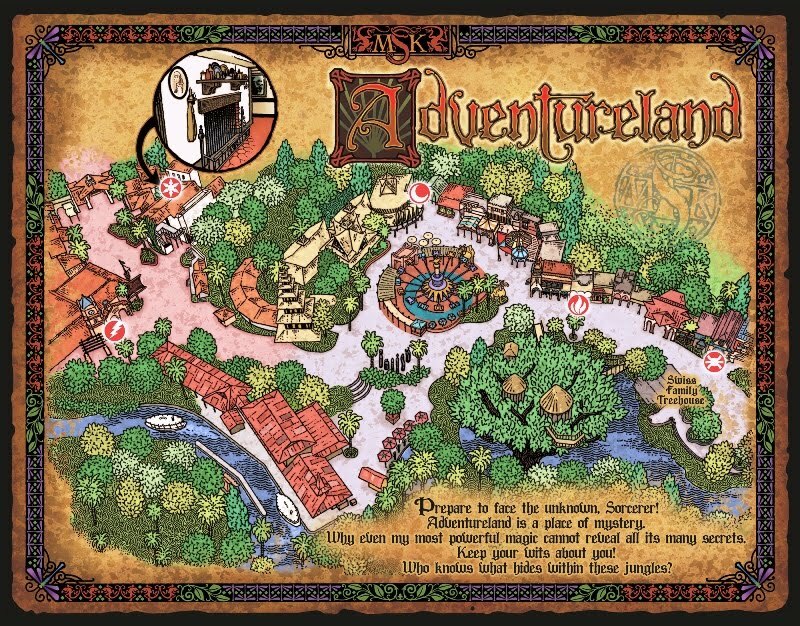 With essentially all the gameplay (at least at this time) taking place on a video screen, it should be fairly simple and relatively inexpensive for the Imagineers to expand and update the game to keep guests of any playing level interested. 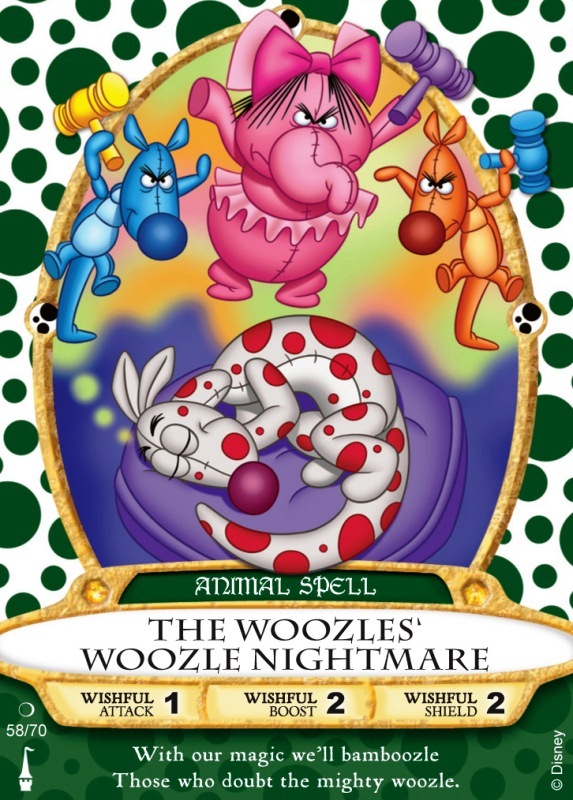 The collecting aspect of the game is already a hit - the cards feature characters (some obscure) from Disney animated features, and have already shown up on eBay. Inpark guests are already accosting others for trades - I wouldn't be surprised to see official trading areas in MK for guests to swap their duplicate cards or search for the rarer ones - and I was told that Castmembers were even trading cards with guests as they were waiting for their turn to play. Disney will reportedly be selling a set of the cards, and other merchandise opportunities seem obvious (card carriers, logo clothing, framed card sets and so on), so this could be a real cash boon for the company. Another thing the game (and others that could follow in other parks) will do is keep a certain number of guests off rides, and could have a positive effect on wait times (I doubt if it will be huge, but could be noticeable). Likewise if would seem possible that the programming of the game could divert a certain number of guests to less crowded parts of the park at different times of day. The current and future locations of the game portals can make guests explore parts of the park they may not normally visit - always a good thing in my mind. Overall I see a big, big upside to this - I'm sure there will be glitches to work through, but I'm excited about what this technology will be bringing! Ryan – Really letting my geek side show, for many years as a younger lad I was a fanatic collector and player of the collectible card game, Magic. The thought of far off realms, casting spells, and iconic heroes and weaponry really spoke to me (perhaps it was my longstanding wish to wield my own lightsaber and my undying love for the landscapes of Bob Ross). Even in those days, I could have never imagined being able to battle across the plains of Walt Disney World, but that is just what Sorcerers of the Magic Kingdom offers. When playing other collectible card games you often wonder what the battle would really look like. Sure, the card’s illustrations helped, but there really wasn’t a way to see how these skirmishes would play out. The interactive portal scenes for Sorcerers of the Magic Kingdom allow each spell to have their own effect on the game as you play through. Oh, and with a starter set of only 70 cards, I imagine more cards will be coming in expansion sets, the collector in me is hungering to grab them all! While I have not yet had the pleasure to play the game, nothing I have seen has deterred my enthusiasm and everything has continued to excite me. I have seen many of the portals during playtesting and the way they were built into the various lands of the Magic Kingdom is extremely well done. The cards pay homage to characters across the history of Disney animated films and are full of bright colors and clever titling. Like I’ve said, everything I have seen of Sorcerers of the Magic Kingdom speaks to my inner geek and makes me want to collect and play this game time and time again! There weren’t a ton of contributors this month for the Gazette Roundtable, I’ve been hearing whispers that most of the other roundtablers couldn’t be bothered to leave Sorcerers of the Magic Kingdom in order to write their thoughts down, so I need the readers help more than ever this month! Have you played the game or seen others playing? What do you think of the cards, the game-play portals, and the overall concept? 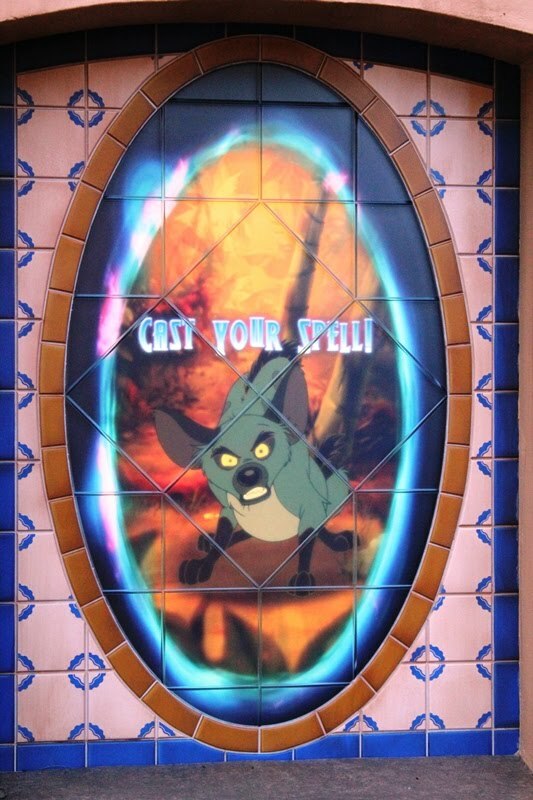 If you haven’t played, what are you excited about or concerned with when it comes to Sorcerers of the Magic Kingdom? We all want to hear from you! I haven't had a chance to play it since my last three trips to MK have been quick ones, but I do plan to try it. I have seen a few guests playing and have noticed a small crowd around a shop window. I'm hoping that the game can spread guests out around the park as Kim Possible does in Epcot rather than collect them in already crowded areas. I've only seen the Youtube videos of the game. My initial reaction: It looks well-done, but very repetitious. It reminds me of "Dragon's Lair" in slow motion (I know I've only seen the "easy" mode.) But, I can get to WDW only for special vacations, and there's no way in blazes I'll spend one second playing this instead of seeing the sights and riding rides. The absolute last thing I want to do when I'm walking through a Disney Park is stare at a screen and play a video game. That said, the cards are awesome, employment for 2D animators is awesome, and I don't think it will ruin the Magic Kingdom for those not wishing to play. It's great for anyone who visits the parks on a weekly basis. Bottom Line: I wish they'd invested the money in an E-Ticket ride. Or fixing Splash Mountain and Expedition Everest. It was fun to play, and the cards are very colorful and fun to collect (you can get 5 per day). The only problem I saw was that a few of the locations were in a bad spot as far as foot traffic is concerned. I saw more adult Disney fans playing this than kids. But the kids who saw us playing seemed to think it looked fun, and they asked where to get the cards so they could get started. There are no "one or the other" scenarios involved. They're all seperate things and seperate budgets.